WASHINGTON — The U.S. Secret Service may have touched a on a sensitive nerve with the San Francisco Chronicle. The agency asked the paper if it could monitor its phone traffic during a visit by Homeland Security Secretary Janet Napolitano on Monday. She had gone to the paper to talk to the Editorial Board. The agency wanted to monitor phone numbers, not conversations, in case of a bomb or other type of threat. The paper denied the request. 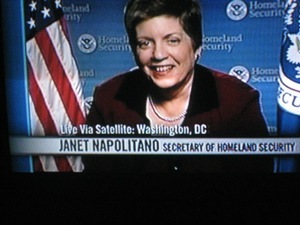 The paper asked Napolitano during an interview if the request was part of a new protocol. “I don’t know the answer,” she told the Chronicle, and said she’d look into the matter. Posted: 4/27/11 at 9:27 AM under News Story.